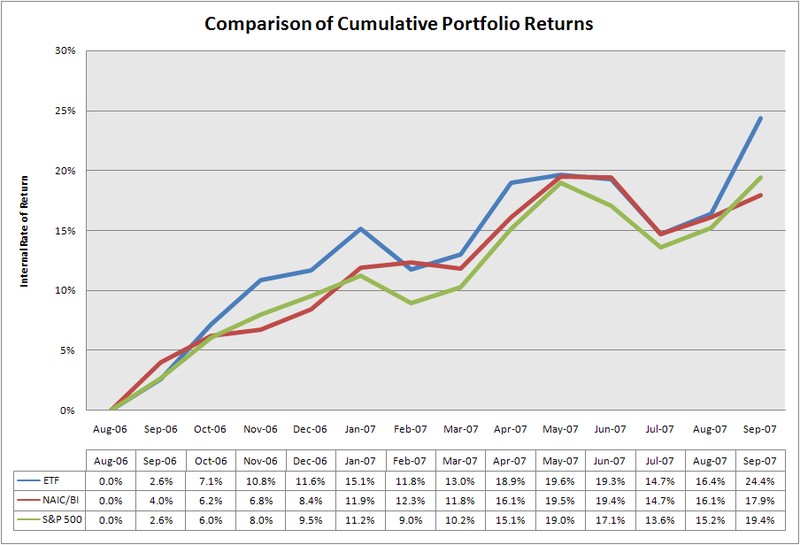 It has been almost six months since we have looked at portfolio returns. The big question is what type of portfolio does best. The portfolio of index-based exchange traded funds seem to be winning. The graph below shows cumulative returns for two equity portfolios and the S&P 500 (with dividends reinvested). The first portfolio is a diversified portfolio made up of exchange traded funds. The second portfolio is a classic NAIC/BI growth stock portfolio. Both are “real money” portfolios and the returns are based on actual positions. The returns are cumulative (not annualized) internal rates of return calculated from August 27, 2006. The portfolio of exchange traded funds continues to have the best return. The NAIC/BI portfolio and the S&P 500 are about even. Note that the comparison only covers a period of 13 months. How can I create a graph like this? I know HOW, but where do I get the monthly data for NAIC, my ETF, and S&P? I calculated the cumulative returns for each month You can get S&P 500 price and dividend data from the Standard & Poors website. The Vanguard S&P 500 index, VFINX, will provide returns that are very close. The ETF and NAIC/BI data are from my portfolios. I plan to update them in the near future. 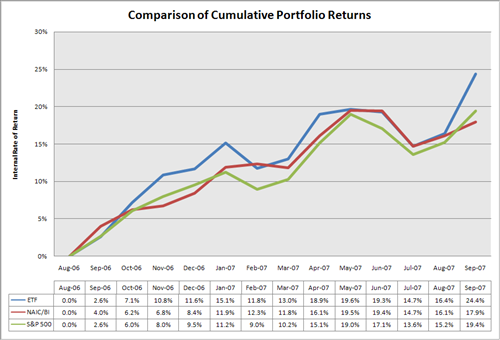 I use Portfolio Record Keeper to calculate returns for my portfolios. However, other programs such as Quicken can calculate return for different periods. Stockherd is a collection of investing ideas for the individual investor. The site is updated only occasionally. Do Equal Weight ETFs Perform Better?